Gran Fondos have something for everyone. If you’re just looking for a huge day on the bike, you you’ll get one. However, unlike a typical century ride, if you have a competitive streak you can race a Gran Fondo for overall standings or age group results. Some events allow you to set times for particular segments of the ride, giving you another way to compete or compare this year’s performance to your previous times. More recently, some Gran Fondos have even incorporated interesting off-the-bike experiences, like the Bottega Gran Fondo in Napa Valley, Ca. that featured world-class food and wine from celebrity chef Michael Chiarello and fellow local restaurateurs. 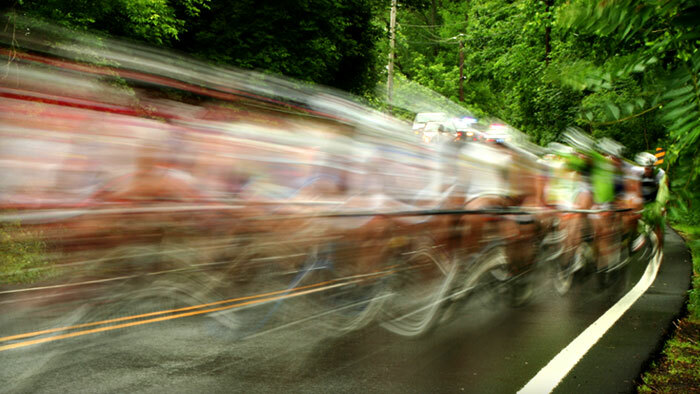 If a Gran Fondo is in your future, here are some tips to make sure you’re ready for it! These days the term Gran Fondo is, at least in the U.S., being applied very liberally to events ranging from 40 to 130 miles. These event include anywhere from a few hundred feet of climbing to more than 10,000 feet of elevation gain. For the sake of this article we will set the minimum for a Gran Fondo at 100 miles and 7,000 feet of climbing. Why? Because 7,000 or more feet of climbing in a timed 100-mile ride is a step up from your local run-of-the-mill century, and that’s what a Gran Fondo is supposed to be. Endurance isn’t usually the limiting factor for athletes signing up for their first Gran Fondo. You’ve most likely done century rides before and given enough time, food, and water, you could pedal your way to the finish line. But now there’s a timing chip, hill segments, and an overall placing on the line, so you’re going to need some speed to go along with that endurance. While longer climbing intervals are great for building the power to climb like a steady diesel engine, you also need to be able to accelerate. High-intensity intervals are often thought of in terms of the ability generate huge power numbers and non-competitive athletes sometimes fail to see a good rationale for that. Here it is: If you develop the power to surge way above your lactate threshold for a short effort, you’re also developing the fitness to recover quickly from those surges. Try a workout like 10 x 2 minute Power Intervals (10 on a 1-10 scale, as high a power as you can hold for two minutes) with 2 minutes easy spinning recovery between them. You’ll improve power at VO2 max, but more important for Gran Fondo performance, you’ll gain the ability to surge on a climb or bridge across a gap and then recover quickly enough to hold your position. A big Gran Fondo is likely to be your longest single ride of the year. With work and family schedules many riders find they can’t replicate their goal event’s mileage, time in the saddle, or kilojoule value in a single training ride. That’s normal, but one way to compensate for limited training time is to build back-to-back training blocks. If you can’t ride six hours or 3,000 kilojoules in one day, schedule two back-to-back days at 3-4 hours or 1800-2,200 kilojoules. You can even build three day blocks, but be sure to schedule two days of recovery after a block lasting three days or more. It may not be a “race”, but you still want to do your best on the day. Use these tips on the day of the event to make the most of your preparation. This is a one-day event, so go in fresh and be ready to completely drain the tank. In the days leading up to the event, have confidence in your training and avoid the temptation to squeeze in “one last interval session”. Staying with a fast group is important. You can always drift back through groups later on, but if you’re too conservative early on you’ll be surrounded by riders who can’t help you move up into stronger, faster groups. Gran Fondos aren’t distinctly categorized like your local criterium; the rider in front of you may have power but little technical skill and even less pack savvy. If you’re trying to finish fast, minimize your time at the aid stations by carrying more food in your pockets from the start. It doesn’t weigh much and means that at least at some aid stations you can just fill bottles and go. It’s not the first 3,000 feet of climbing that will get you, it’s the last 3,000 feet. No matter what you do you’ll get slower as the day goes. Your sustainable climbing power will decline, but if you charge up the early climbs, you’ll crawl up the final ones. Be patient in the early climbs– even if it feels like you’re going slower than you could be. You’ll be rewarded with good climbing legs in the finale. If you are looking for a new challenge on the bike, a Gran Fondo may be in your future. As much of a race as you want it to be, these events serve as a great goal for all levels of cyclists. With just a few tweaks in your weekly mileage you can have fun, go fast and be your best. Jim Rutberg is a Pro Coach for Carmichael Training Systems, Inc. (CTS) and co-author of several books with Chris Carmichael, including "The Time-Crunched Cyclist, 2nd Ed." and "The Time-Crunched Triathlete". For information on personal coaching, training camps, and Endurance Bucket List events, visit http://trainright.com.